A potter (name Perenge) crouching down beside a newly made pot with three lines of incised decoration around the rim. 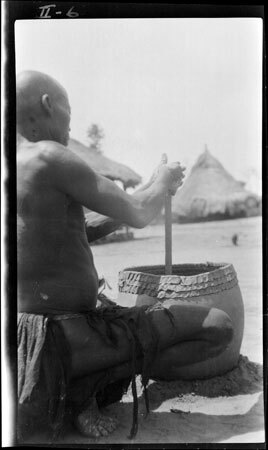 He is holding a stick that is possibly weighted at the top, and may have a rounded weight at the bottom for smoothing and compacting the base of the pot so that it will stand upright when fired. Note on negative m/s ink - "II-6"
Morton, Chris. "Zande pot makin" Southern Sudan Project (in development). 03 Jan. 2006. Pitt Rivers Museum. <http://southernsudan.prm.ox.ac.uk/details/1998.341.727/>.